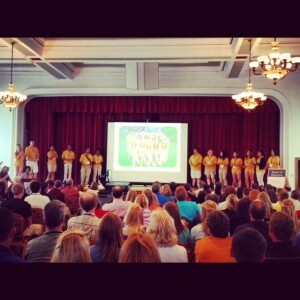 Have no fear, 2012 Orientation is here! The Orientation Leaders are introduced to the students and parents for the first time! Learn about St. Rose– There is a TON of information that we give out at orientation. We definitely make use of every minute we have at Orientation. Students and parents learned all about St. Rose as we went to presentations from offices all over campus that came to tell us about everything from academics to social life and everything in between. There’s a lot to remember, so if you forget, don’t forget that you can always contact your Orientation Leader via email when you get home! Make new Friends– I think it’s safe to say that just about everyone is nervous about coming to campus and fitting in. I know I was really nervous about that when I was in your shoes! It’s cool to see this from an Orientation Leader’s perspective- as a whole, the group is rather quiet in the beginning, but at check out, students are exchanging numbers and waiting for their friends to gather belongings from their rooms and meet up with their parents. FREE STUFF!!! We like to give away free stuff at St. Rose. I tend to notice this most when I want to wear a shirt that doesn’t say something about St. Rose on it. At Orientation, you will definitely walk away with a sling pack, water bottle, and class of 2016 t-shirt (the design YOU chose). You’ll also have plenty of chances throughout the day and at the Late Knight Social event to win more St. Rose gear! 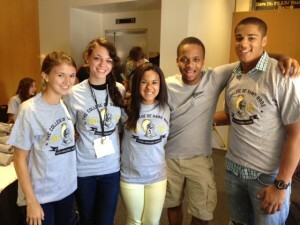 Orientation Leader (and Blogger) Myles with 4 2016 students in their new t-shirts! I can’t wait to meet the rest of the class of 2016. Thank you again to my group for a great first session. See you all in August!! ← Friends here and there!